It is 1944. The Germans occupy Warsaw. The Soviet Red Army is close by on the banks of the river Vistula. On 1st August the Polish Home Army (Armia Krajowa) launches their attack on the Germans and the Warsaw Uprising has begun. Sixty three days later 15,000 Polish fighters and 200,000 Polish civilians are dead. Warsaw lies in ruins. Norman Davies, The Guardian (UK) 8 November 2003, wrote in Lest We Forget. By 1945, our Polish allies had lost at least six million of their people - half Jewish and half Catholic. But their sacrifices were largely ignored. No place was found for them in our grand post-war victory parade...The critical moment in this tragic story was August 1, 1944 - the outbreak of the Warsaw rising...40,000-50,000 half-armed men and woman answered the call to attack the Wehrmacht and SS...Stalin described the rising as a "criminal adventure"; and refused landing rights to the RAF Squadron which Churchill had ordered to supply Warsaw from southern Italy. Warsaw, in consequence, bled to death...After the war, all public memory of the Warsaw rising was suppressed in the Soviet bloc. The last commander of the AK, General Okulicki, who had been flown into occupied Poland by the RAF, ended up in a show trial in Moscow for "illegal activities". Thousands of colleagues perished in the Gulag or in communist jails. Publisher - Published in 2003. The Warsaw Uprising 1944 website has photographs, movie clips, documents, memoirs, personal accounts, and other related material. The Warsaw Rising Museum shows not only the military struggle of those 63 days but also the everyday life of civilians. A carefully researched and argued indictment of the Churchill government concerning its treatment of the Poles during the Warsaw Rising against the Germans by the Armia Krajowa (Home Army). The generally accepted view of historians is that the uprising was an ill-conceived, romantic exercise of the Polish commander General Bór-Komorowski. The truth is something dramatically different...The strategic mistake of the Poles was to trust their British allies to support a rising that ostensibly had the full backing of Churchill and about which the British had full knowledge in all stages of planning...Norman Davies, who is probably the greatest historian of Poland ever, has laid out a brief of bravery and betrayal that all Polish statesmen might well heed. It is one of the most savage indictments of Allied malfeasance yet leveled by a historian. Unsparing in his depictions of the slaughter of the Polish fighters and the destruction of their capital, Davies challenges the popular assumption that World War II was entirely the triumph of good over evil...After Hitler commanded the SS chief Heinrich Himmler to take charge of operations in the city, orders were issued to put down the rebellion and reduce the Polish capital to ruins: ''We shall finish them off,'' Himmler declared. ''Warsaw will be liquidated. ''...By October the rebellion had been crushed. Fifteen thousand of the partisans had been killed, and between 200,000 and 250,000 civilians lay dead...Davies accuses the Allies of failing in virtually every respect in August 1944, because their priorities lay elsewhere...Sixty years on, the uprising remains one of the most unforgettable episodes of the war. For Poles, it is the subject of a never-ending conundrum — was the rising an act of heroic if doomed self-defence, a historical imperative, or was launching it an act of criminal recklessness, resulting in the death of hundreds of thousands and the destruction of the capital?...The issue will not go away because it has affected and continues to affect life in Poland. As it took such a toll of the inhabitants of the capital, it effectively decapitated Polish society, robbing it of a huge portion of its intellectual elite. Since the city was levelled in consequence, it also destroyed a vast proportion of the nation’s cultural heritage. Despite the meticulous reconstructions, one cannot walk around Warsaw today without being aware that one is walking over a battlefield....The persecution of the heroes of the rising by the communist regime in Poland in the late 1940s and early 1950s makes particularly sickening reading, as much by its sheer injustice as by its brutality. But he is right to bring it out into the open, as it helps to explain much about what is happening in Poland today, as well as revealing some of the darker aspects of the war...one comes to realise that this powerful book is not so much about the Warsaw uprising as about the defeat of liberal democracy in the second world war. In August 1944 some 40,000 anti-communist Poles rose in revolt against Nazi occupation...the Russians lingered beyond the Vistula 15 miles away, while the SS spent two months recapturing the city block by block amid unspeakable cruelties. "From a historical point of view," Himmler told Hitler, "the revolt of the Poles is a blessing. We shall finish them off. Warsaw will be liquidated." So, indeed, it was. 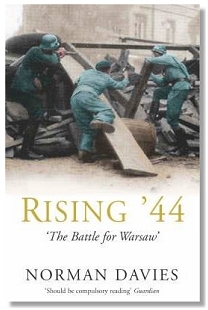 Some 250,000 civilians were massacred by the Germans before the last shot of the struggle was fired on October 2, 1944...Norman Davies has produced a moving elegy for those doomed romantics who fought so nobly, and to such tragic purpose, in Warsaw in the autumn of 1944. It was the Poles' misfortune to be loathed both by the Russians and the Germans, and to be regarded with indifference by most of the western Allies. Before it is possible to understand why the uprising's leaders took the seemingly irrational decision to launch the battle when they did, it is also necessary to understand just how terrible the joint Soviet and German occupations of Poland had been, and just how desperate the citizens of Warsaw had become...The end of the book is so tragic as to be almost unreadable: the arrest, imprisonment and trials of Home Army members - on the grounds that they supported a free, not a Soviet-occupied Poland - and the exile of the uprising's leadership. This page was added on 01 June 2008.